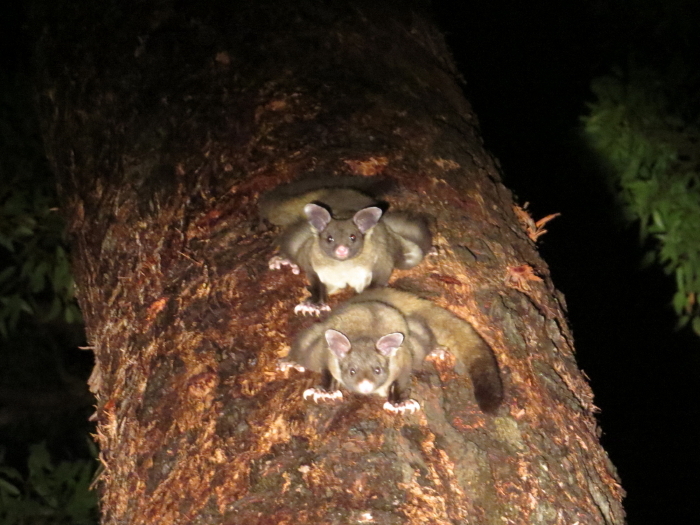 There are more species of possums and gliders in this area than anywhere else in Australia or the world. 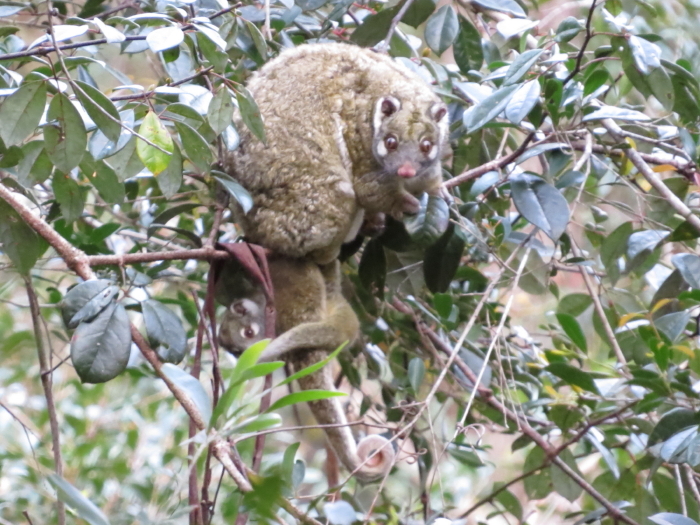 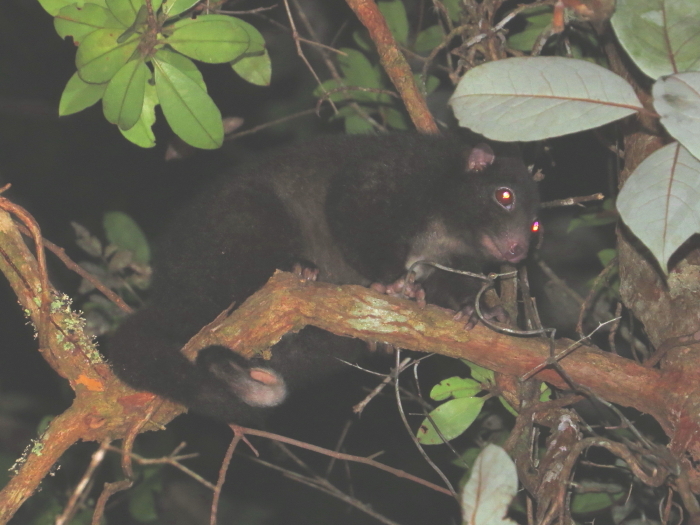 We have rainforest specialists as well as species that mainly feed on eucalyptus leaves. 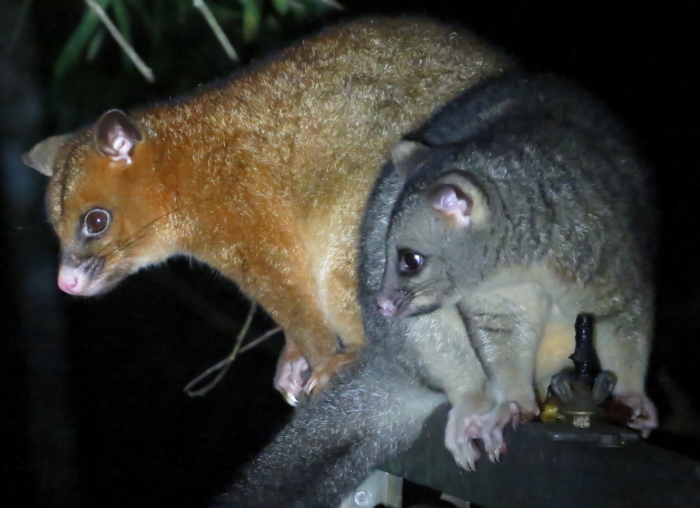 Common Brushtail Possums here interbreed with Coppery Brushtails, which results in some bi-coloured individuals. 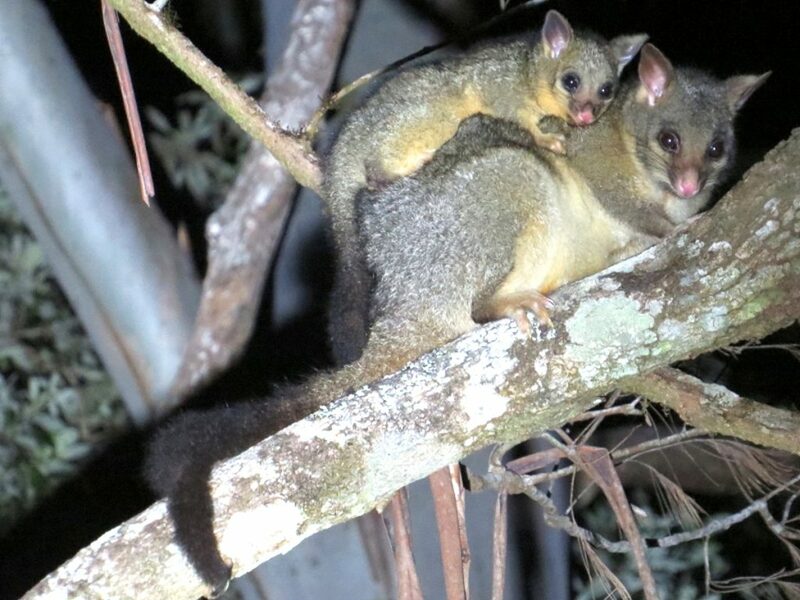 As both species are not shy at all, you’ll be able to watch them ambling past the veranda in the early evening, on their way to check the bird feeder for left-over fruit. 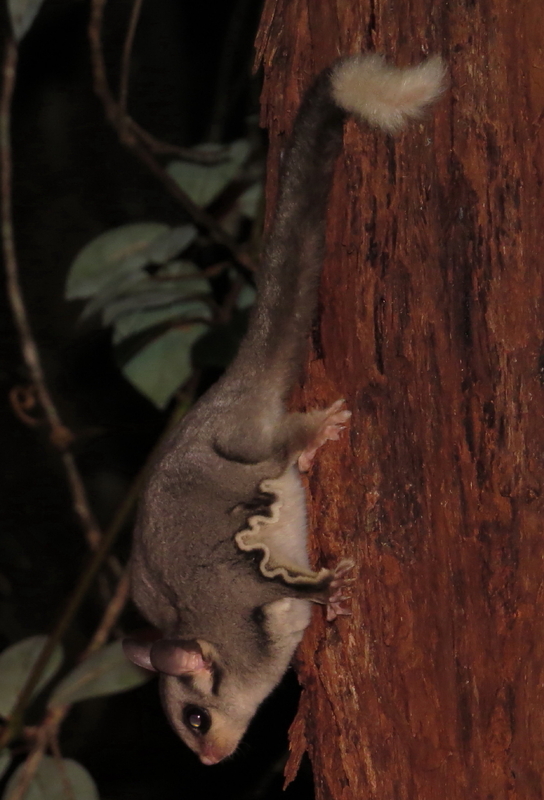 AND there are the Yellow-bellied Gliders, that make incisions into the bark of Red Mahogany trees, to feed on the resulting sap exudate. 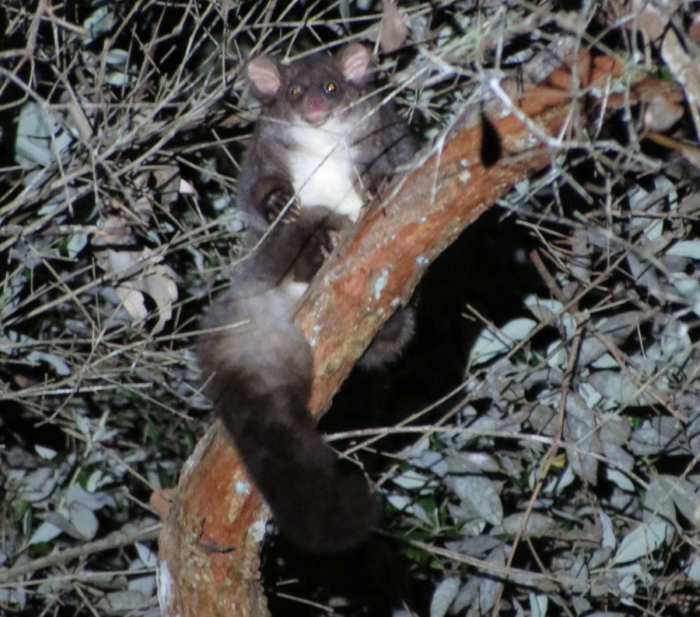 These feed trees also attract Feathertail Gliders, Sugar Gliders, the odd Striped Possum and a variety of birds and insects during the day. 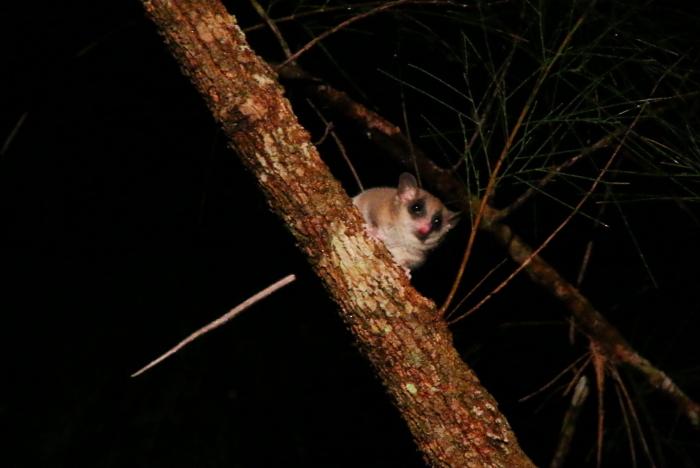 Yellow-bellied Gliders are very vocal creatures, and you can sometimes hear their characteristic calls when they are travelling through the forest. 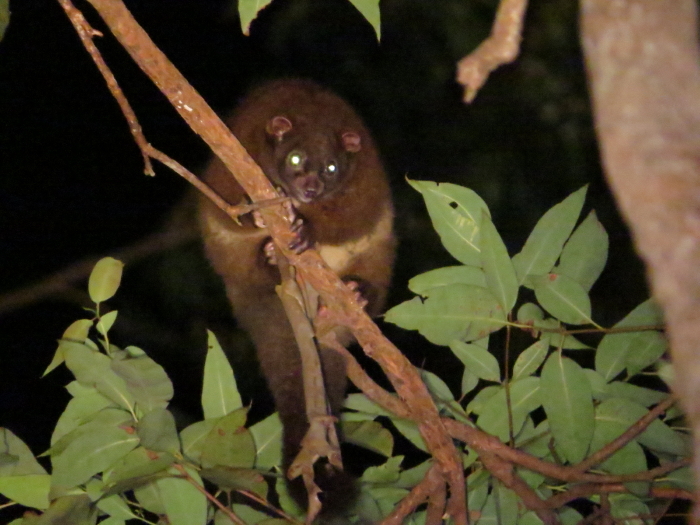 It is one of the weirdest calls you will ever hear! 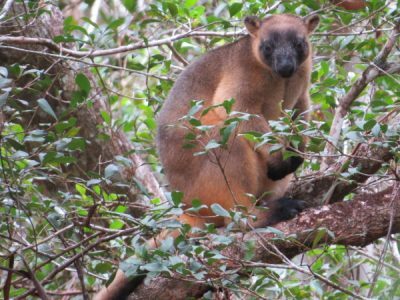 On the ground you may see Red-legged Pademelons, Swamp Wallabies AND a loud crashing thump lets you know that a Lumholtz’s Tree-kangaroo saw you first and jumped out of a tree. 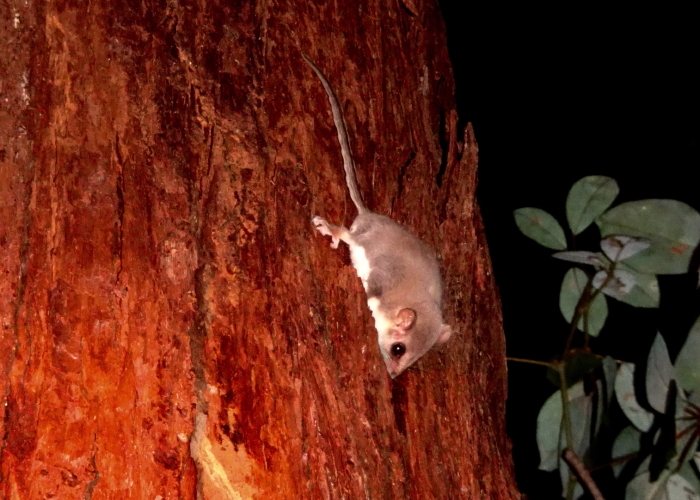 Rufous Bettongs live in the drier part of our forest. 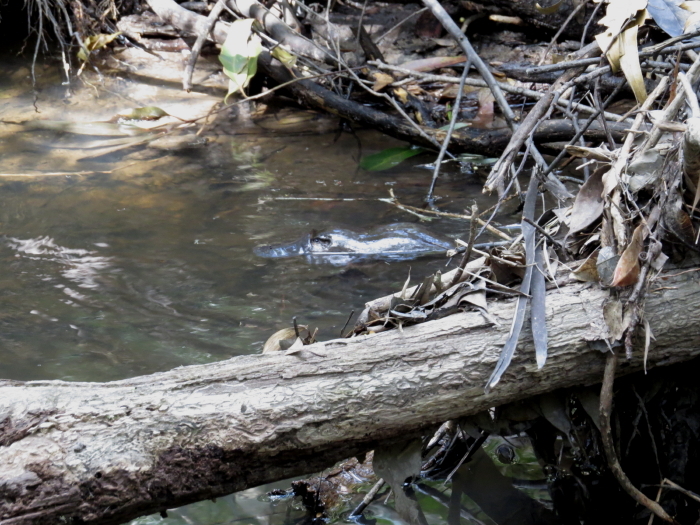 Our little creek runs for most of the year, and you might spot a platypus or a similar-sized water rat (which is a very attractive-looking rodent). 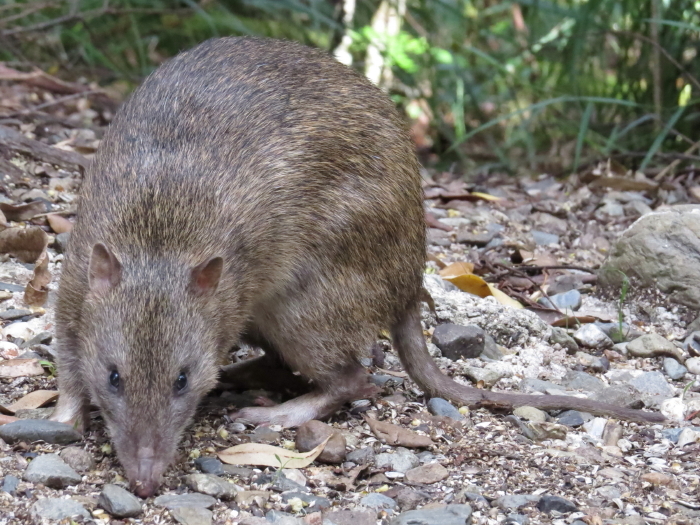 At night very industrious bandicoots are poking their noses into the mulch layer and leaving cone-shaped holes behind, in their search for beetle larvae and other tasty morsels. 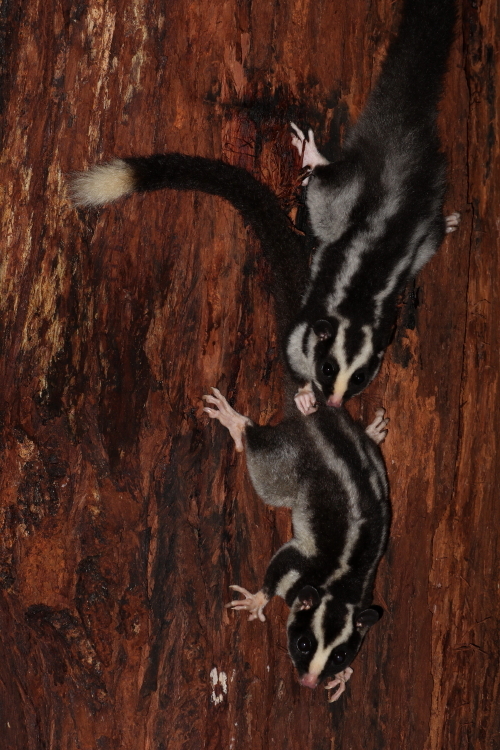 Some are even bold enough to forage in the early afternoon in broad daylight. 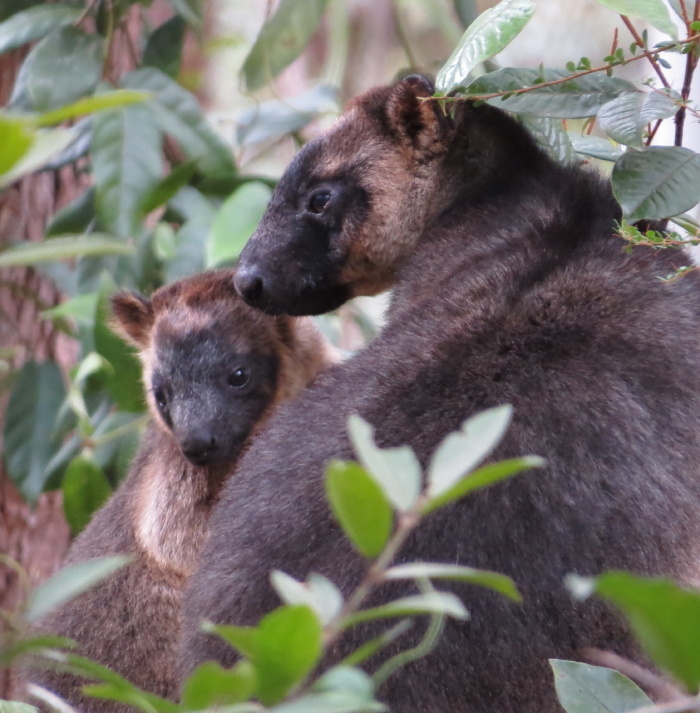 Little Red Flying-Foxes visit our flowering Red Mahoganies for several weeks in summer, and Dingoes can sometimes be heard howling on a nearby hill. 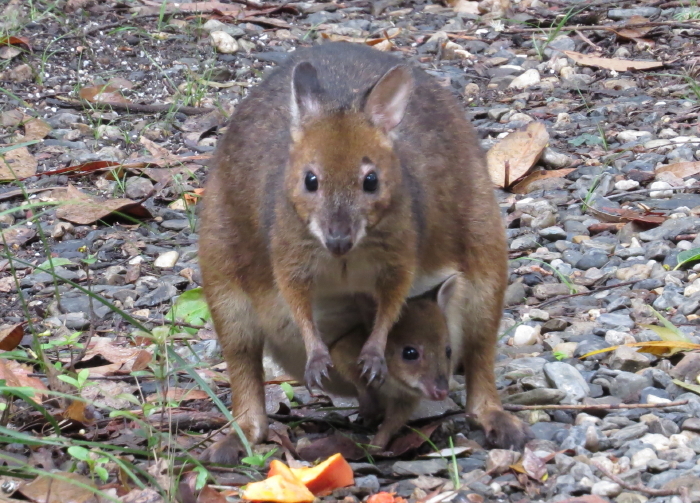 You might spot a transient Agile Wallaby, usually a young male looking for a new mob. 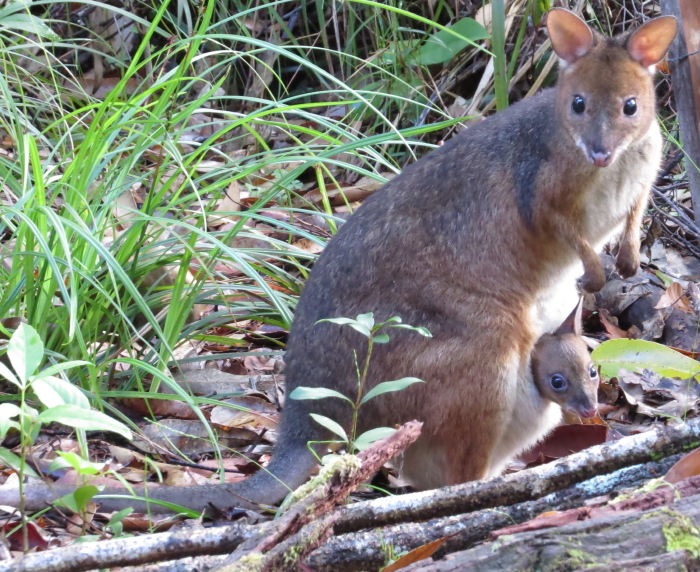 Large mobs of Eastern Grey Kangaroos live only minutes away from us.